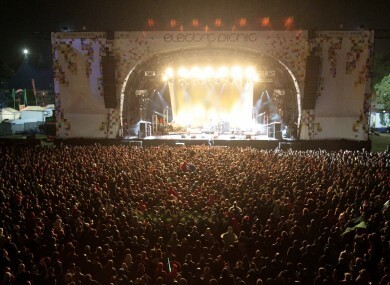 IN PERHAPS THE swiftest update ever, Electric Picnic 2014 has now sold out. Cling onto your tickets like they’re precious angels. Earlier this evening there was a flurry of panic online after the official Facebook and Twitter accounts for Electric Picnic posted statuses claiming that the Laois festival was at capacity. Then DailyEdge.ie heard straight from the horse’s mouth that it was “not quite” sold out, before it was once again officially announced that the tickets were in fact all gone. An Electric Picnic source told DailyEdge.ie that there was some confusion earlier, somebody got ‘over exited’ and the Twitter and FB statuses went out when there were a handful of tickets left. The capacity has increased this year to 41,000 which is a huge increase on the 30-odd thousand that have attended the Stradbally event in previous years. Email “UPDATE: Electric Picnic has just sold out”. Feedback on “UPDATE: Electric Picnic has just sold out”.